As a marketer, you know how critical it is to understand how your marketing efforts contribute to the bottom line. There’s a lot that goes on behind-the-scenes to generate sales pipeline and ultimately revenue. And by becoming a data-driven marketer that’s in tune with the right metrics, you can demonstrate marketing’s contribution to both. Metrics illustrate the impact that you and your team are driving in the organization, which is critical to ensure you have the budget and resources you need to deliver optimum business outcomes. 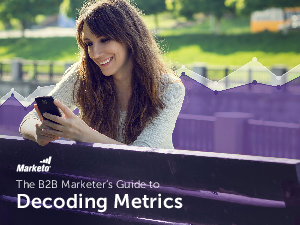 Without metrics, it’s nearly impossible to measure the success of your activities and identify elements to optimize in future campaigns. And without them, there’s no way to determine your return on investment (ROI).